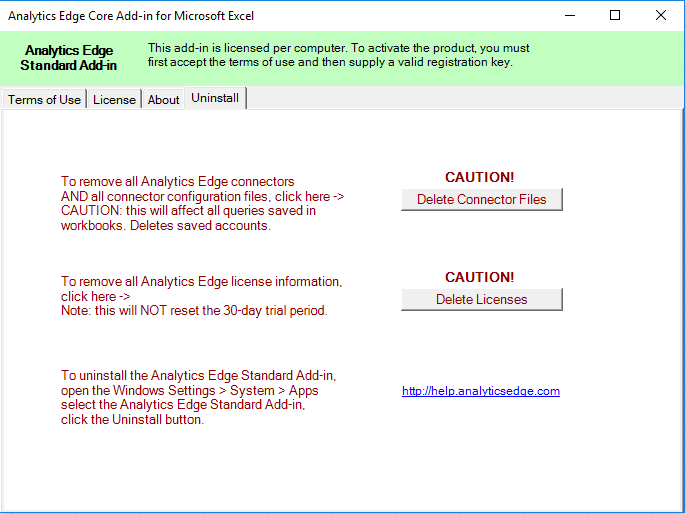 Once you have the latest version, open the License wizard – in Excel, go to the Analytics Edge ribbon, and find the button: it will be labelled “License <state>” where the <state> could be EXPIRED, # Days, UPDATE or blank. At the top of the License wizard, navigate to the Uninstall tab. Start by Deleting the Connector Files [READ THE CAUTION NOTE]. You will need to restart Excel to complete the process since some of the connector files are in use while Excel is open. Restart Excel to complete the removal of the connectors. Answer Yes if you are asked to remove all previous versions of the connectors. Note that individual login account information can be removed for a single connector using the Accounts wizard in the connector itself; the Delete Connector Files button removes all account information. Note: Analytics Edge does not store any account or query information on its servers. It exists only on your computer. 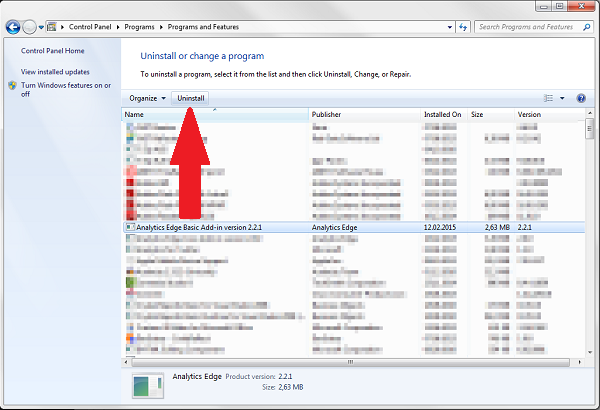 To remove the add-in itself, close Excel, then go to [Windows 7: Start > Control Panel > Uninstall a Program] / [Windows 10: Windows > Settings > System > Apps & features], select the Analytics Edge Add-in from the list; and click Uninstall.